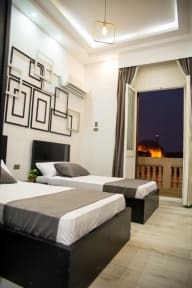 We are two friends working in hostels for almost 9 years and two years ago we started the Egyptian night hostel to maintain an awesome accommodation we chose our location in the heart of Downtown, Cairo. The historic neighbourhood which dates back to the 60s of the 19th century, and powered the location by many facilities to guarantee a unique and awesome accommodation. - Free pick up from the airport when booking for 3 nights. First time to stay in a hostel in Egypt. And I was so glad about the hostel it’s so clean and organized. The staff is so nice! Nice accommodation with very helpful staff! Great place. Jimmy and his family run this and another hostel and were wonderful. Ahmed helped me book my tour plans and Jimmy gave me advise on what to do / not do and buy / not buy souvenir wise to not get ripped off. The day I left on the train Ahmed give me a "day" room after my tour was over so I could shower and take a nap before the night train. Jimmy's cousin also took me to the train station which was nice as it made finding the train and dealing with a seating issue much easier. Staff is very helpful. Location is great. U can travel to other areas from here by Subway or walk. Great budget hotel, very friendly and helpful staff. Very clean, with comfortable beds, I had a great night's sleep over all three nights. As a history geek I loved the location right opposite the musium. Will definatly stay again if I come back to Cairo. 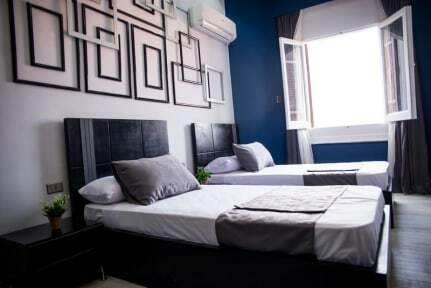 If your looking for a cheap, clean, comfortable bed and well located budget hotel. Search no more. What a great location with extremely modern facilities. Great value overall, with a special mention to the fantastic breakfast!